This Princess Lace echeveria succulent attracted my attention with its vivid color in the succulent garden bowl on a California patio. I was just moving out of a phase of painting Persistence of Pink macro views of flowers and this seemed like a good transition to another direction. That new direction became a series of succulents that I spent 2018 working on for a November show in Anacortes, WA. For the past few years I've been painting flowers up so close that they envelope the viewer in their sensuality and rich color. Enlarged, they become almost abstractions from nature without seeing the outer shape or the environment around them. Frame Size: 31" x 39"
I’ve been using watercolor and ink brush line in my illustration work for nearly 20 years, but in a much more controlled and predictable way. My pictures appear on book jackets, ads, posters, logos and packaging all over the country and Canada. If you’d like to see my world of client driven projects, check out my published artwork at http://sandyhaight.com. 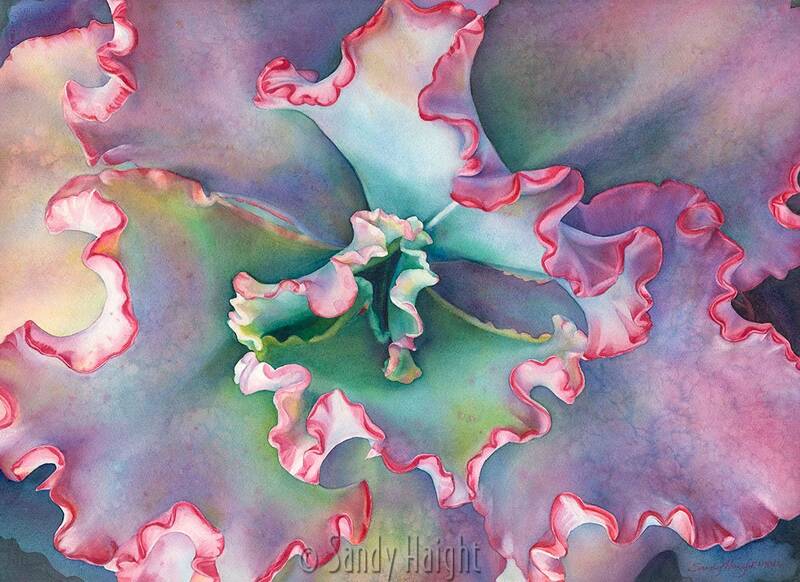 My Floralscapes, Watercolor Life Drawings and Sumi paintings can be seen on my fine art web site at http://sandyhaightfineart.com. I was honored to win the gold prize as poster artist for the Skagit Valley Tulip Festival in 2016 with my watercolor painting of a tulip bouquet. In 2012 I qualified to be a signature member of the Northwest Watercolor Society (NWWS). This is earned by being juried into a select number of local chapter and international watercolor society shows sponsored by NWWS. The initials now follow my signature in recent paintings.